It’s only been four days since the 2017 FemGeniuses arrived in Berlin, and we’re not yet used to the patterns of short, unexpected rain showers that occur so frequently in the city. 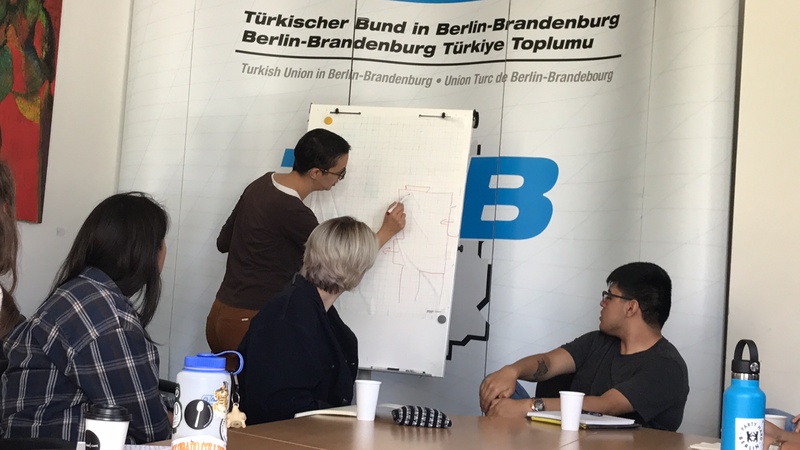 We are, however, learning more about Berlin public transport, and were successfully able to navigate a few buses and U-Bahns to arrive at the ADNB des TBB office this morning for a discussion about Gladt and SAWA with Salma Arzouni. Still, the afternoon was also a circular discussion that weaved through privilege, whiteness, migrant and refugee trauma, and the political nature of this hard work. Salma began the discussion by situating their work in the context of various organizations. Gladt is a cross between NGO and non-profit organization—they require funding, some of which is necessarily from the government, but they do not seek any profit from their work. This work is centered around assisting non-white, LGBTQ+ of Color individuals of migratory history. Though Gladt mostly started for individuals from Turkey living in Berlin, their scope has broadened over the past twenty or so years. Then, provides LGBTQ+ migrant or refugee individuals the tools and assistance they need to successfully navigate the private housing system. SAWA is intentionally made to help migrants of color who identify as LGBTQ+, because so much of the system works against people at those intersections. The housing process in Berlin is massively bureaucratic—if you don’t speak German or English, your ability to navigate this process alone is significantly impaired (not to mention all the classic negative stereotypes that surround people of color and/or queer individuals being so present in the power dynamics between housing owner and potential tenant). SAWA works to teach these individuals about the process, giving them the tools to navigate it with autonomy, but also with personal support. As Salma emphasized, this project is critical for LGBTQ+ migrants’ survival and success in Berlin. From there, we flowed into an exploration of the importance of the representation and visibility of queer individuals of color. Overwhelmingly, many organizations that serve the LGBTQ+ community are run by white cisgender gay men. These groups generally have the most influence and are generally given the most funding. This way of giving power to those organizations supports a homogenization of queer identity, and is an explicit erasure of the rich variety of the queer community. This conversation reminded me of “Queer Injuries: The Racial Politics of ‘Homophobic Hate Crime’ in Germany” by Jin Haritaworn, who argues that “sexual assimilation is performed as a repetition of Muslim unassailability” (76) and examines how the visibility of queer communities is centered on people that are “white, young, non-disabled, non-trans, male…and assimilable” (77). Certainly, these exclusive norms do a particular kind of violence to those who don’t fit the ideal. Regarding Salma’s work specifically, we focused here on underlining migrant identities of non-dominant religions, races, national locations, trans and non-cis-male identities; these identities are validated by Gladt because it is run by others of those identities. Gladt provides people who are usually otherwise lacking one with a space overwhelmingly occupied by individuals like them, a problematically rare but welcome and highly necessary sight for Gladt’s clients. The white-washing of queerness is a global issue. We certainly have this problem in the United States, and while there are critical differences between American white-dominated queer spaces and German ones, they both revolve around the same/similar problems stemming from white privilege. For example, the white and Western concept of “coming out” as an authentication of queerness, and the “rainbow culture” of gay performance are all ways in which white privilege exerts its control and prevents valid visibility of other ways of being LGBTQ+. These white-dominated notions of the acceptability of queerness necessarily exclude ways of being by migrant queer individuals, a problem that Salma addresses in their “advising social work” with Gladt. Along with their colleagues, Salma emphasized to us that they work to ensure the maintenance of a safe space with certain authority in order to uphold the variety of their communities of practice. Though here we focus on the identities of individuals who work with Salma and Gladt, homogenization is a dangerous concept across the board. As R. Ruth Linden notes in “Troubling Categories I Can’t Think Without: Reflections on Women in the Holocaust,” there is a tendency “to privilege the experiences of one group […] while turning our gaze away from other groups” (24). Like Haritaworn, Linden underlines the problems we talked about in our discussion regarding the use of “universalizing, foundational, and ‘natural’ terms” (29). 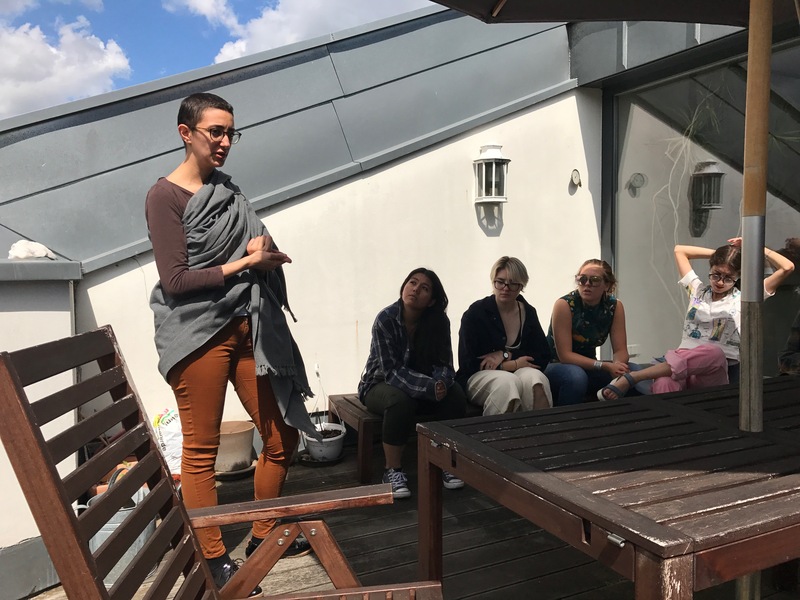 Though our conversation was rich with varied topics surrounding specificities of the refugee crisis in Berlin, we even pushed it out of the ADNB des TBB office and into extended time on Heidi’s apartment balcony. One of the areas of conversation that struck me the most was hearing Salma talk about the heavy politics of activism and how that interacts with their personal life. While it is a nonprofit group, Gladt does depend on a certain amount of governmental financial aid; when Gladt or its employees say or do something too blatantly against government policies or ideas, they toe a fine line. Going too much against the government may result in threats or realities of a loss of funding, but going too much with the government and their ideas can occasionally rub against Gladt’s morals or policies. People in positions like Salma are forced to prioritize and make deliberate choices in the types of work they do—this is an exhausting process and, because this type of work requires heavy personal emotional investment and care, burning out is a far too common phenomenon. Salma was incredibly transparent with us regarding the difficulties of doing this type of work in the real world, which I found to be exceedingly valuable. They talked about how school can only teach students the theory and ideas, but absolutely nothing except practice will truly teach students about how to effectively work in the field of social work for LGBTQ+, migrant/refugee, and various other oppressed/marginalized groups. Salma emphasized the point that to work in a field like theirs means “you really have to feel a deep connection to the work.” She continued, “You really have to want to be there [and to really do things],” if you want to make any sort of change. As a student, it was striking to so tangibly hear from someone so invested and hardworking in the field of “activist” social work. Salma did us the benefit of not sugarcoating their opinions and not beating around the bush; they made it very clear how difficult work like theirs is, but not in a “you’ll never succeed” way and more in a “get ready if you want it” mindset. My individual experience as a student of Feminist in Gender Studies has certainly told me about work like Salma’s, but the reality of the work becomes suddenly much more immediate when you see it in-person. To me, that’s one of the main reason the FemGeniuses in Berlin choose to take the class each year—to have these conversations about our area of study that make it so much more palpable and realistic. Meeting with Salma during the first week was a powerful way to start the block, but we had to cut the conversation there because we were already late—we had an Anne Frank Museum tour that afternoon. As Salma told us, this work is time- and emotion- and energy- consuming, it is hard, it is necessary, it is ongoing, and it will certainly continue. Nora Holmes is a rising senior at Colorado College, and is on track for a major in Organismal Biology and Ecology and a double minor in Feminist and Gender Studies and Human Kinesiology. 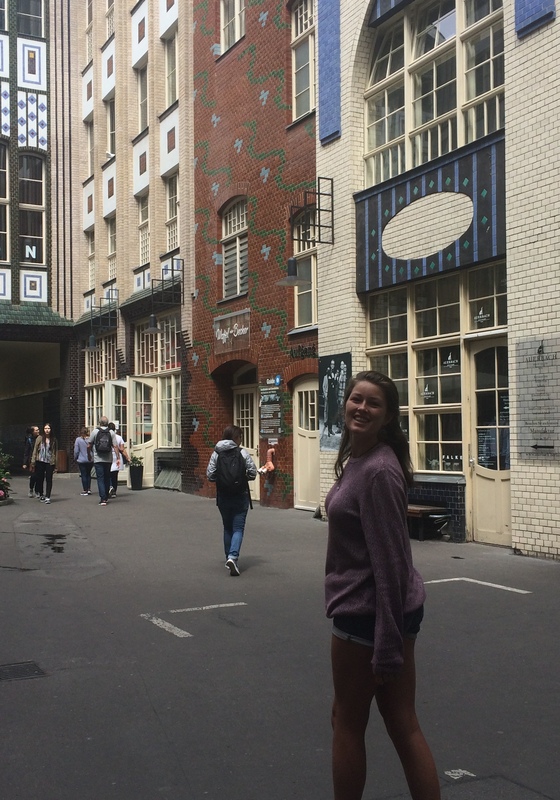 She enjoys getting moderately lost in Berlin and using a paper map to navigate her way home. Don’t remind her mom, but though Nora grew up in Connecticut, she feels very much at home in the mountains of Colorado. She spends most of her time playing rugby, in the climbing gym, or debating the merits of different brands of peanut butter with her housemates.